Judging by Sweetie’s thrashing and crying, you would think the bottles I am serving were poison. The kind straight out of old-school sci-fi that have green bubbling liquid and mysterious vapor and foam cascading down the sides and all that. In reality the sun is shining, a first since the beginning of the week. The temperature is perfect, the breeze gentle. Overall it is a beautiful day in Chicago. When it comes to bottles, though, today is not a good day. It doesn’t help that by 1:30PM I still have not been able to take a shower. Last night’s laundry is still sitting unfolded on the table. The to-do list, even today’s short one, has not been touched. We are both frustrated but I am trying to hide behind gentle words and forced smiles (because children, particularly young children, don’t see right through that). Sweetie embraces her frustration and just squirms and cries. 45 minutes later the bottle is done. Sweetie is lying peacefully on the play mat “circus” so I re-adjust my stretched out t-shirt and take a few breaths. On a whim I sing the finger song (you know the one…”where is thumper?”). Sweetie watches contentedly and even cracks a smile. Today is just one more reminder that sometimes we get it right and sometimes we get it wrong. To me it is also a humbling reminder that even though she is new, this little life is already filled with mystery and dichotomy. As the afternoon peacefully wanders on I am thankful that there is happiness in there as well. My daughter snores. Depending on the day it can be a quiet rumble, like a cat purring. Other times, she can tear it up. But coming through the monitor her 3 month-old snoring is cute…we’ll see how that develops. My childhood friend, Captain Jack, reminds me of this story whenever the topic of sleep or snoring comes up. It makes me smile every time. Obviously, I am also reminded of it when I am lying in bed listening to my daughter’s baby-snores on the monitor. I find myself grateful for her snoring. It is just simple evidence that she has not stopped breathing. I don’t sleep the same as before her arrival, and I was warned about this by other parents. When a night noise wakes me up I spend an extra minute listening to the monitor to be sure everything sounds right from Sweetie’s room. I suspect that my sleeping habits are forever changed by this new person…maybe I should be thankful that right now it is only by her snoring. I have a steadily growing “Wish List” of things that I would like to happen from writing this blog. I am not sure how realistic the list is, but it is fun to let my mind wander. Some of these things are more of a stretch than others. I am thinking about merchandising. I would start with something easy like decals, t-shirts and patches. Maybe grow into “one-sies”, caps, beanies, spit-up towels. There could be an adult line as well as a kid line. Maybe I should get the logo dialed in first. I would like to be a guest on the Ellen DeGeneres show. I know that Ellen is not a stay-at-home Dad. And that she and Portia de Rossi are not yet parents. But I think Ellen is a funny, great, generous woman and she is high on my list of people who I would like to meet. Since I don’t have a popular daytime show we would have to meet at hers. Or she could stop by the house the next time she comes to Chicago. I would like to sit down with Bob Harper and Jillian Michaels to talk about the parts of me that have gotten “squishy” since staying at home (I guess that was one benefit to running around for 12 hours a day fueled by caffeine). I would like their help developing a SAHD workout, like something that I can fit in at nap time. I figure Bob knows men’s bodies better, and Jillian knows parents’ lives better. She left a popular television show to take care of family – she can offer some insight! I am not looking to lose weight, so I don’t know that I need Dolvett Quince and Alison Sweeney to come by, but the whole crew is certainly welcome. I figure it is more people to become enamored with Sweetie! I would like to have lunch with Rick Bayless. When the weather gets warmer Sweetie and I are going to take a trip downtown. I plan on visiting Xoco for lunch, so maybe we will see him there. Rick is a father to a daughter and might share some insight. Or maybe some warnings! I want to pick his brain about urban farming and alternative energy implementation as well. Hey – at the very least we will get to try the food. I want to drive Wife and Sweetie in the Century to have lunch at Superdawg. Wife and I once gobbled down a quick dinner while Sweetie napped, but that’s not the right way to do Superdawg. And the Versa is just not as cool at the Century. At this writing the front sheet metal is all off and the car is not running. But that’s okay because Sweetie can’t eat hot dogs yet. I do have more time now to work on the car once we put Sweetie to bed. Now I just need to get to it. I would like this blog to turn into a revenue source. I am going to explore writing contributions, sponsorship, the above mentioned merchandising. It would be nice to have my income coming back in, so I will see if I can’t get something going. Oh yeah, it would also be nice to have money for the Century project and maybe some new tattoos. I better get working on those postings! Wow, I almost forgot. I would love to hear from President Barack Obama. I think it would be cool if he weighed in on the site and even better is he shared some of his Dad-knowledge. He is a Dad to two daughters – definitely something to tell there. He is usually pretty busy when he comes back to Chicago, and I don’t see myself in DC any time soon. Oh yeah, and he has an entire country to manage. Anyway, here’s hoping. I would like to meet more stay-at-home Dads. I plan on contacting the Chicago Chapter of the National At-Home Dad Network. And I am going to research celebrity Dads as well. I know there are others out there, but I want to meet them. I was at a recent social event with Sweetie and found that we were surrounded by more caretakers than parents. And I get why it works out that way – we almost went that route. But this is a tough gig sometimes, and sometimes I just need a little boost. Wife is supportive and great about giving me a day off, but I think meeting other stay-at-home Dads will better serve the experience. I set out on this blog-sperience to show my support for stay-at-home Dads but even I need that support. What a random list. Again, I don’t really know where this is going (which is why it is “uncategorized”). And some of these are obviously more realistic than others. Well, let’s see what happens. At first I was not what I would post under the “Uncategorized” heading (and unfortunately did not figure out how to remove it). But since getting going with this stay-at-home thing and this blog thing, I am finding that sometimes my thoughts and experiences don’t fit into my nice little categories. So I will use this section for random entries, miscellaneous thoughts and ramblings…you know the misfit toys. Not too much structure to these entries, but I think they will still have their substance. Like most things these days, I think I will find the value as I dig deeper. 13 August 2012 – How Did I Get Here? It is not hard to trace my literal path here. It starts at Loyola University, where my wife and I met. There I chose to major in Theology, thinking it would set me apart from other pre-med students. Then I chose future plans that did not focus my med-school bid like it was my world. After college were my years in social services. There I chose to work with Chicago’s homeless, mentally ill citizens. Then I got distracted. In the midst of a budding career as an Outreach Worker I decided to make a switch to the automotive industry. I chose to move to a town in Wyoming that was smaller than the neighborhood where I lived, just to learn the basics quickly. I chose to work with my hands, despite the dust and the noise and the chemicals…and the bachelor’s degree. I chose to move to Denver, Colorado, to be closer to family and to live again in an urban setting. After a few years I realized that my future family would only grow in one city, and I chose to move back to the Midwest. Coming back to Chicago I chose collision repair work over custom work, thinking it was more stable. I chose to purchase a house with Wife (then girlfriend), a 100-year-old bungalow. In the front room of our house I chose to propose to the woman I had dated for nine years. At work I chose to move up the ranks, looking for compensation for my mind’s work as well as my hands’ work. And at home we chose to grow our family. Looking back I see the important theme: I chose. For better or for worse my path is paved with my decisions. Granted, I did not choose to clean dirty diapers or spend my days preparing baby food. But that’s just a small part of this adventure. I did not choose to leave my job during shaky economic times, but rather chose self-preservation and a sabbatical. I did not choose to be a house husband…until I did. We all know the lessons from life are cumulative and help us with the next adventure. I feel bolstered by my previous decisions and experiences. And I feel prepared by the challenges that I have seen. 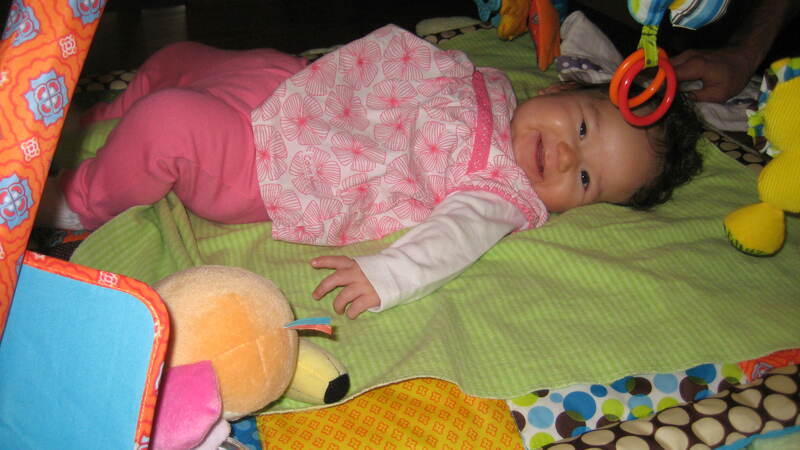 I have chosen to be a stay-at-home Dad and make this experience great for myself and Sweetie. So after a deep, head-clearing breath, I quietly hummed The Talking Heads to myself. I cleaned up Sweetie’s poop diaper, acknowledging that it wasn’t the first and won’t be the last. I got her dressed for the day, and set about finding a cup of coffee.